PrivateVPN Review 2019 - A Competitive Price and Good Netflix Support? Almost all the VPNs you will come across would promise you fast download and upload speeds, but very few VPNs actually deliver on their promises. PrivateVPN is a Sweden-based VPN which lived up to my expectations. The VPN service, which was launched by a company named Privat Kommunikation Sverige AB back in 2009, has gradually moved up the ranks in the VPN market, particularly because of its customer-centric services such as P2P sharing support and Netflix unblocking capabilities. Should you invest in this Swedish VPN which has only little over 100 servers around the world? Let’s find out. PrivateVPN is a fast-evolving VPN which has the potential to become one of the best VPNs available on the market right now. It allows you to connect to six devices simultaneously, has a no-logs policy (albeit questionable) and covers all the bases. The easy-to-download and use VPN have four different client for the major four platforms, namely Windows, iOS, Mac and Android, besides offering support for a wide variety of routers. The core VPN services looks thoroughly capable. There are more than 100 locations in 59 countries, including Australia, Russia and Singapore. You will get support for all the major protocols, including OpenVPN, L2TP/IPsec, L2TP, IPsec, IVEv2, and PPTP. The VPN, which was founded in Stockholm, Sweden, bills itself as the ‘world’s most trusted VPN’, although there are security loopholes that you might be wary of. However, with 2048-bit encryption with AES-256, unlimited speed and bandwidth and a kill switch feature embedded within, the VPN is worth a try. “PrivateVPN does not collect or log any traffic or use of its service. If you are browsing our site, you don’t have to give us any identifiable information. For more information see the “cookies” section further down. Torrenting and P2P sharing is allowed on PrivateVPN, which simply means you can connect to other torrent users to move and share large files, especially movies, music videos and software setup files easily through any of their servers. Unlike many other VPNs, all of their servers are torrent-friendly. However, the company strongly recommends using their Sweden-based servers only. Since they use military-grade encryption, you can actually torrent and file share without worrying about getting intercepted. You need to reset and configure your torrent client and use the port the app provides you. Can You Access Netflix with PrivateVPN? Of all the VPNs I reviewed to date, this one really stands out when it comes to Netflix-readiness. Apparently, the VPN was specifically designed for Netflix users. While most VPN services have come a cropper since Netflix started to block all sorts of VPNs, this one managed to ride it out really well. I tested out five of their servers and all of the servers worked in my case! To be specific, I tested out their US Los Angeles and New York servers, as well as their Canada, Netherlands, and United Kingdom servers (one each) and each one of the servers let me stream Netflix content without a hitch. Clearly a winner! This is one of the best Netflix-ready VPNs I have ever tested. If you are travelling to the Far East country and you want to access Netflix, Instagram and Facebook (because life is too boring without the social media and streaming sites that surround us, right? ), you can use PrivateVPN to bypass the geo-restrictions in China. While most standalone VPN services don’t come with a ‘Stealth Mode’, PrivateVPN developers have recently introduced this feature. PrivateVPN ensures that no leaks happen and they use the highest level of security encryption to ensure zero IP leaks in China. The company offers IPv6 Leak Protection, along with DNS Leak Protection, a Kill Switch, and an Application Guard. Therefore, if you are toying with the idea of using the VPN while in China, you can do with complete peace of mind and access all the geo-restricted sites and services by bypassing China’s great and infamous firewall. I have found a good article from the company’s blog explaining why PrivateVPN is one of the “Best VPN for Travel to China for Work (And Entertainment After Work)”. In order to gauge the popularity of a specific search term in a particular region, you don’t need a crystal ball, but Google Trends. It’s a marketing tool from the house of Big G that offers valuable insights about recent and past search trends in different niches. I decided to give it a shot to figure out how popular PrivateVPN has been in the US region over the past few months and years. It seems there is a certain pattern in the overall popularity of the search term ‘PrivateVPN’ in the US region. The popularity of the VPN has been more or less the same over the past five years. There have been occasional drops in popularity, but it seems the VPN has been moderately popular in the US all the way since 2014. ‘Buy PrivateVPN’, however, did not return with any interest data, whereas ‘PrivateVPN review’ has been a much popular search term. Like most other top VPN services, PrivateVPN also allows unhindered access to all the top social media websites, such as Facebook, Twitter and Instagram, among others. No matter where you are located, you can just launch the application and connect any of their servers to access your favourite social media websites. For example, your workplace might restrict access to social media websites to increase employee productivity. However, if you are a PrivateVPN subscriber, you can easily get past the restrictions imposed by your employer, or by any other authority, and log in to your favourite social media site. Most VPN service providers claim that their servers are the fastest, although very few VPNs offers really good upload and download speeds. You cannot just trust their market speak as most VPNs don’t even live up to the expectations of their users. To understand how speedy PrivateVPN actually is, I tested out a number of their servers using Speedtest.net. To be more specific, I tested out one Netherlands server, one US server and one Hong Kong server. The US server’s download speed was about 4.7 Mbps and upload speed was 7.63 Mbps. Download and upload speeds for their Netherlands server were 19.83 Mbps and 23.07 Mbps, respectively. However, their Hong Kong server’s download and upload speeds were nowhere near the benchmark. Speed-wise, PrivateVPN performance was really inconsistent, to say the least. PrivateVPN offers a detailed installation guide, which makes it quite easy for new users to get the client on their devices. Clearly, the developers are keen on making installation as easy and simple as possible. The desktop client for Windows is also aesthetically brilliant, and since the client is equipped with several encryption protocol options and top-notch privacy features, it becomes all the more user-friendly. However, selecting servers is not quite easy as the application displays a whole big list of servers. Also, the list of servers doesn’t come with specific information regarding server load, and the speed you can expect from each of the servers. PrivateVPN has both live chat support and ticket-based support options for its users. After opening their website, you can easily locate a ‘contact us’ bubble near the bottom end corner of the homepage. The PrivateVPN app also has a live chat support option which appears as a button on the top left corner. However, when I tried contacting their live chat support team, no one really showed up. So I chose the other option, filled up a form with my name and email address and typed in my query to raise a new support ticket. I got an email conformation of the ticket raised within seconds, but got a reply from their support team almost after 10 hours. While the VPN service provider has kept their support system quite simple and down to the bare bones, their FAQ page is really helpful. You can check it out if you need to know a little more about their specific features and services. PrivateVPN’s pricing structure is easy to understand and the various subscription plans come really cheap. The monthly plan is the most expensive option, as with every other VPN service. It will set you back for $7.67 a month, which is still a cheaper option compared to the monthly subscription plans of many other VPN services. If you go for the three-month plan, you can actually save 55% compared to the monthly plan as you only have to pay $14.63 (or $4.88 per month). However, the biggest surprise awaits the users who prefer long-time pricing. If you go for the yearly plan, which costs $3.82 every month, you will get 1 month extra free of charge. Technically, you can pay for full one year and use the VPN for 13 months! Also, all of their features are available across all the plans. There’s also a 30-day moneyback guarantee, but I suggest you pay particular attention to their refund policy before going for any of their subscription plans. 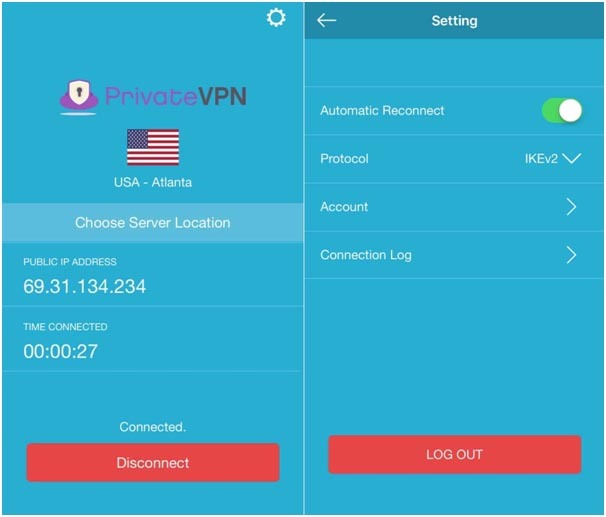 If you are particularly looking for a VPN which has got robust encryption features and is easy to use, PrivateVPN is a decent choice. They offer nearly everything a VPN user typically looks for, including leak protection, a kill switch, six simultaneous connections for all subscribed users, and good customer service. On the top of it, torrenting and P2P sharing is fully allowed and you can also access all the social media networking sites and streaming services, no matter where you currently live or are travelling to. But their server park is quite small, which was a major turn-off for me. If you want a bigger pool of servers (but you don’t mind paying a couple of bucks extra every month), go for IPvanish VPN or CyberGhostVPN instead. But if you want to stick to a VPN that covers all the bases and comes at a cheap price, PrivateVPN is your thing.